Columbia, SC, USA; South Carolina Gamecocks guard Jaylen Shaw (5) drives around Akron Zips center Isaiah Johnson (23) in the second half at The Colonial Life Arena. COLUMBIA, S.C. (AP) — South Carolina coach Frank Martin knew he was going to have growing pains with seven freshman and five sophomores in his second season with the Gamecocks. Over the course of the last four games, he’s mostly liked what he’s seen. 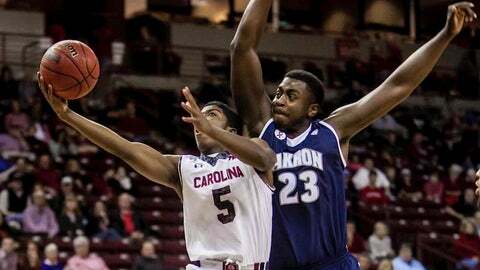 Senior Brenton Williams scored a season-high 24 points to lead South Carolina to a 78-45 victory over Akron Saturday afternoon at the Colonial Life Arena to win consecutive games against the Zips in a span of four days. "Guys are really buying in to how we need to play to be a good team," Martin said. "Guys are starting to get a better understanding of the effort, enthusiasm, and discipline that it takes to be a good team." It’s the first time this season South Carolina (5-6) has won consecutive games and they have won three of the past four after opening the season 2-5. "I told them in the locker room– `Understand what you have done to allow you to feel good and build on that. Don’t relax and take a step backwards,’" Martin said. "That’s a good team we just beat back-to-back." The two teams played in the third-place game in the Diamond Head Classic in Hawaii on Christmas night. The Gamecocks earned a 69-59 come-from-behind victory in that contest before the teams traveled 4,680 miles across the country for the rematch. It was close for a half with South Carolina holding a 30-24 lead at the break, but a 17-1 run to open the second half was too much for the Zips to overcome. Akron (6-5) missed their first six shots of the half and suffered seven turnovers in the first 8 minutes to allow South Carolina to race to a 47-25 lead. Akron went a total of 9:55 without a field goal until Pat Forsythe broke the streak with a jumper with 11:51 remaining. Seven Gamecock players scored, with freshman guard Sindarius Thornwell leading the way with five points. Right after Forsythe’s basket, Williams hit back-to-back 3-pointers to make it 53-27 and the lead was never than less 23 points the rest of the way. Akron finished with 21 turnovers and only hit 5 of 19 shots with 13 turnovers in the final 20 minutes. "They amped up and really got in the passing lane," Akron coach Keith Dambrot said. "We couldn’t run anything because of that and when we went on our own a little bit, we didn’t handle it very well." Williams connected on 6 of 8 3-point attempts for his third-straight game in double figures. He had played sparingly until four games ago and he’s averaged 13.2 points since. "I think it was a mentality thing first of all," Williams said. "I just triggered myself to not start games off comfortable and be as assertive as I can. My teammates gave me confidence and they need me to be aggressive so that’s what I’m trying to do." Martin saw that type of aggressiveness from Williams in the early part of last year, but he disappeared at the beginning of the SEC schedule. Williams didn’t begin playing many minutes until late in the year and he had a 38-point effort against Mississippi State on March 6. "Brent is engaged in making a difference in the process of turning this program back around," Martin said. "He did this early last year then went AWOL on me and then by the end of the year, he reconnected again. I’ve been talking to him about not doing that again." Michael Carrera scored 13 points and grabbed seven rebounds for South Carolina and Mindaugus Kacinas finished with 11 points. Quincy Diggs led Akron with 13 points.